The East Pointers will be embarking on tour this spring and summer, but before they hit the road, the PEI-based three-piece have unveiled a video for their rendition of a Nirvana classic. The group recorded a cover of "In Bloom" while they were in Newcastle in the midst of a U.K. tour, and they've treated it to an accompanying video. The East Pointers' version is decidedly less grunge-y, opening with palm-muted acoustic guitar before breaking into a rousing banjo, fiddle and vocal harmony-backed chorus. "'In Bloom' has always been a favourite of ours — it's such a great song with a very unique chord and melody vibe," singer Tim Chaisson tells Exclaim! "A few days before playing Lee's Palace in Toronto last year, we were chatting about how Nirvana played the same venue almost 30 years earlier. This was our acoustic tribute to them that night." 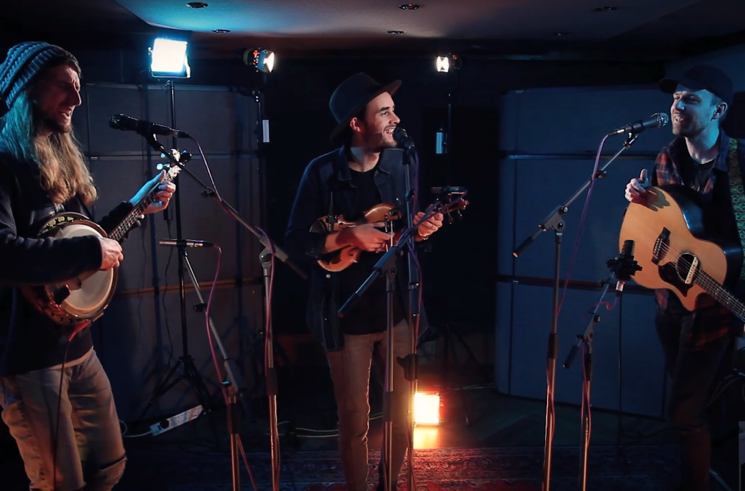 Watch them perform their take on "In Bloom" below.